Review by AllTheBestFights.com: 2017-04-15, fight not so exciting between Ricky Burns and Julius Indongo: it gets two stars. The world champion in three different weight classes Ricky Burns entered this fight with a boxing record of 41-5-1 (14 knockouts) and he is ranked as the No.7 super lightweight in the world (currently the #1 in this division is Terence Crawford). He lost to Omar Figueroa Jr in 2015 (=Figueroa vs Burns) but then he has won four consecutive bouts beating Michele Di Rocco (=Burns vs Di Rocco) and Kiryl Relikh in 2016 (=Burns vs Relikh). His opponent, the Ibf and Ibo super-Lw champion Julius Indongo, has a perfect record of 21-0-0 (11 knockouts) and he entered as the No.3 in the same weight class. He fought three times last year winning over Allan Kamote, Fabian Lyimo and Eduard Troyanovsky (=Troyanovsky vs Indongo). 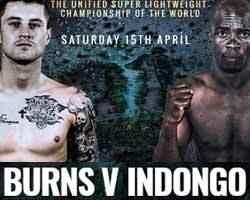 Julius Indongo vs Ricky Burns is valid for the IBF, IBO and WBA World super lightweight titles. Watch the video and rate this fight!